Published on Saturday, April 19, 2014. From left to right: Jessica Pigza, Erinn Batykefer and Laura Damon-Moore speaking at the April 2014 ACC Library Salon Series event. Earlier this month we welcomed Jessica Pigza, librarian and author of BiblioCraft: A Modern Crafter's Guide to Using Library Resources to Jumpstart Creative Projects to speak at our April 2014 Library Salon Series alongside Laura Damon-Moore and Erinn Batykefer, fellow librarians and cofounders of the Library as Incubator Project (LAIP) and authors of The Artist's Library: A Field Guide. 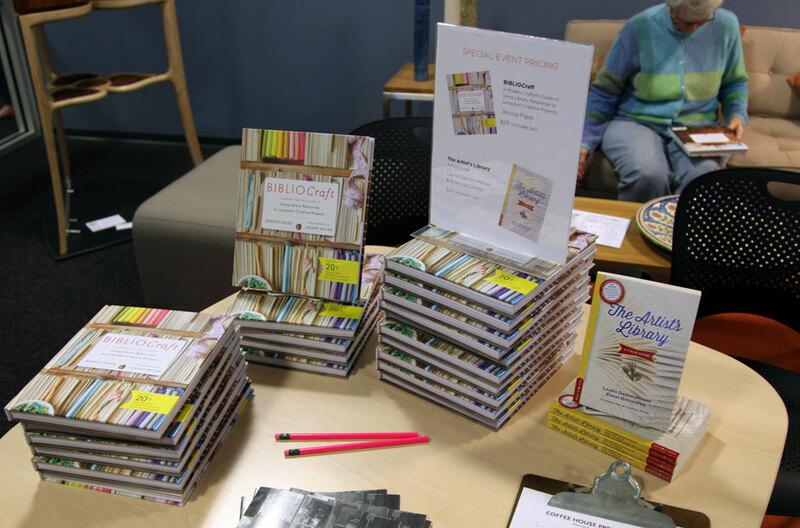 In partnership with Coffee House Press, the theme of the salon was "The Library as Material." Together Laura, Erinn, and Jessica provided insight into the many ways artists of any skill level can use libraries as a resource and vice versa - how libraries can reach out to and partner with artists. Speaking to a standing-room-only crowd of artists, crafters, readers, and fellow librarians, these three innovators inspired us all to both make and to bring creativity into any setting - be it public, academic, or an art museum library. Prior to the salon, we sat down with our three speakers and asked them to share a little about their respective books, library-related projects, and aspirations. For those of you who couldn't attend or would like to hear more from our presenters, please take a look at the short video above and get inspired to visit your favorite library. We promise you'll come away viewing library resources in a whole new light. Cofounders Laura Damon-Moore and Erinn Batykefer dish on their new book The Artist's Library.